I admit I never used to pay attention to insects unless they were eating my plants. As a gardener and a person who always admired nature, the more visible world grabbed my attention. But in my job as a horticulture agent, people frequently want to know how to “get rid of bugs” in their landscapes. So I started to go deeper into the world of insects and have become absolutely enamored. People don’t like insects because they are afraid of them and their creepy crawler nature, or they don’t want them to hurt their plants. The reality is they are performing countless necessary tasks every day. They pollinate plants, they keep each other in balance, they breakdown the enormous amount of dead organic matter created by plants every year, and they are also a food source for many, many kinds of wildlife. We literally can’t live without them. A more practical philosophy is to get to know your insects, so that if a population does get out of balance, you can make a better decision about whether to treat it or not. Also, try to create an environment that supports a wide range of insects, so that the “good guys take care of the bad guys” and we humans can stay out of the fight. Create a more hospitable landscape by planting a variety of plants and flowers, provide a source of water (birdbaths), and avoid pesticides if at all possible. Remember, at least 90 percent of the insects in our gardens are beneficial. Buying a hand lens, also known as jeweler’s loupe (available online), was the first step into insect infatuation for me. 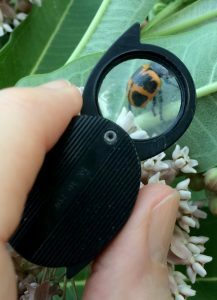 These inexpensive, small magnifying glasses allow you to see exquisite detail and activities of small insects. This morning I was watching a tiny bug the size of a needle head, rolling its even tinier eggs around the back of a leaf. Identifying insects can be tricky, so having a hand lens is absolutely necessary to view mouthparts, count leg segments and wings, and other particulars. Having good light to view the insect under the hand lens is also critical. If daylight is low, you can put it in a baggie to look at it under a lamp and if it’s too frisky put the baggie in the refrigerator to slow the insect down. The freezer will usually do them in. Bigger insects like caterpillars can be preserved in alcohol. To find the insects, look for holes in leaves or ones that are mottled color or curled on the edges. The backs of leaves are often where insects hang out and lay their eggs. New growth is tender which is attractive for feeding. Flowers will host many flying insects, and searching under rocks will often reveal beetles, sow bugs and millipedes. Once you start looking, especially with a hand lens, you will see them everywhere. There are chewing insects (holes in leaves) like caterpillars, piercing/sucking insects (yellow curled, or bumpy mottled or curled leaves) like aphids, insects that eat other insects, ones like butterflies that love nectar, others that chew up dead plant material and even those that feed on blood, like mosquitoes. All insects are part of the taxonomic order Insecta, and all have a body divided into three parts (head, thorax and abdomen), three sets of legs (spiders have four sets and are not insects), and two antennae as adults. They are grouped into approximately thirty different classes. You can learn much more about the insects you find in your garden by going to bugguide.net. But don’t despair if you have trouble identifying an insect, there are over 900,000 different ones known in the world, more than 80% of all species. I take photos with my smart phone to help with identification, and even bought a phone attachment that lets me get close-ups of insects. I told you I was hooked on those six-legged creatures. 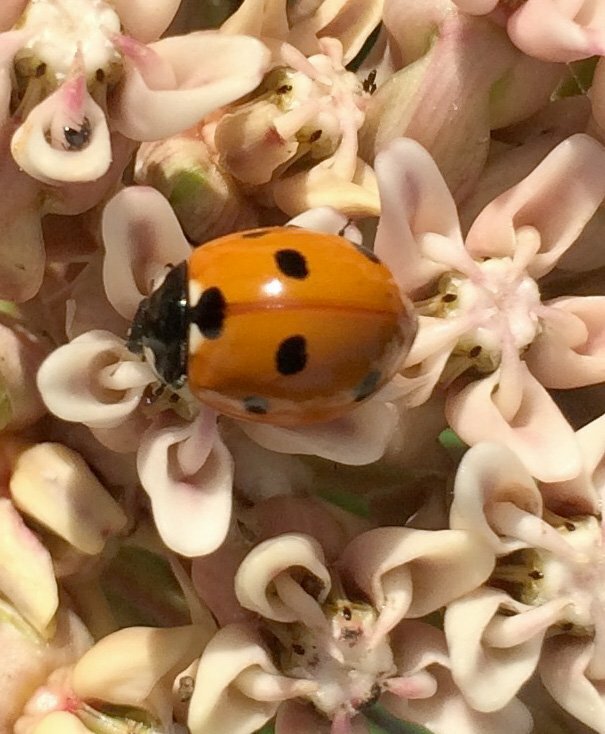 Six beneficial insects that every gardener should know. Bumblebees – They are indefatigable pollinators, and generally non-aggressive. 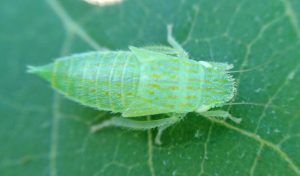 Lacewings – While the adults are generalists, it is the larvae that do the lion’s share of the work and are sometimes called “aphid lions” for their extremely carnivorous appetites. Lady beetles – Commonly known as ladybugs, these are primarily aphid predators. Parasitic wasps – Also called Parasitoids, those that kill their hosts, tend to be specialists, with each species of wasp targeting a specific insect. Syrphid flies – The larvae are important predators of scales, thrips, mites, and especially aphids. Tachinid flies – Effective against a number of pests, including Japanese beetles, squash bugs, and many types of caterpillars, they lay their eggs directly into or on the outside of the host, killing the host.